If you like Pina Coladas… getting lost in the rain. Pina Colada E-Juice is the fantastic flavor of coconut and pineapple. It’s sweet and refreshing, with a flavor that will not overwhelm your tastebuds. This vape flavor is smooth and will have you daydreaming of tropical paradise. You will instantly be reminded of the delicious beverage with each draw. 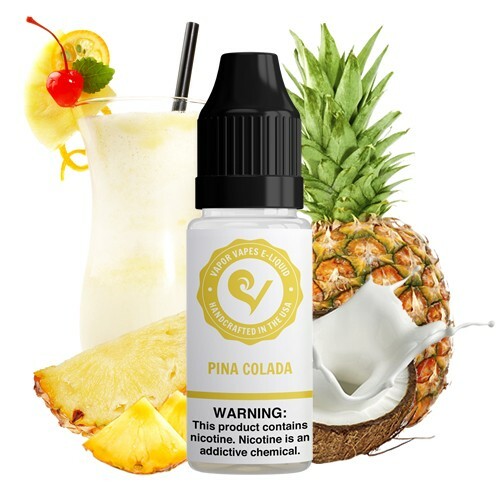 Kick back and relax with Pina Colada E-Juice, just don’t get lost in the rain. Pros: Great for all day vaping, just the right amount of sweetness without it being sickly. Awesome clouds with 25/75 PG/VG and 6mg and vaping at 25 - 35W, but doesn't leave the throat feeling dry. Cons: Although I had Extra Flavour 13%, would get Extra Extra flavour next time as I found the flavour to be a bit too subtle. 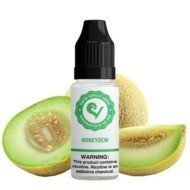 Final Thoughts: Vapor Vapes are the best e-juices I have bought so far and looking forward to trying other flavours. Cons: Pina colada taste different from ever place I have gotten it from, some good some not so good.. this one was not so good unfortunately.. didn't taste like pina colada.. Final Thoughts: Wow that is all what an amazing product. 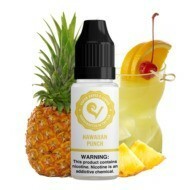 Pros: Vapor Vapes Pina Colada e-liquid is my favorite flavor. 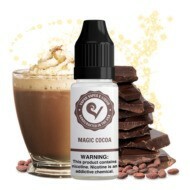 I've been vaping for 6 years now and I've tried many different e-liquids, blends and flavors. I buy the PG/VG | 50/50 blend, it's a perfect balance of flavor and vapor volume. 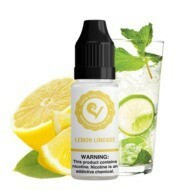 V V's e-liquid is high quality and a great consistency. Since I've been buying from V V, I've noticed my tanks last longer. Pros: Pina Colada is my favorite E juice. The flavor is not overpowering. The coconut and pineapple combo is refreshing! Love Vapor Vapes--my daughter and I have been customers almost since the store opened. Customer service is top notch!! We will never buy e juice from another site or store ever again! Keep the exciting new flavors coming, though I'm hooked on Pina Colada, I love to try new mixes. Final Thoughts: I feel lucky that my daughter "happened" upon this site. I love all the e juice choices, as well as the accessory choices. I appreciate the fact that I can order specifically to my taste-- level of nicotine, mix type, add ons, etc. 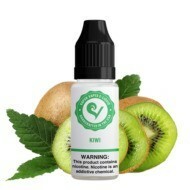 The owner has always been available to answer questions and fix my hastily incorrect order recently : ) Vapor Vapes has always used the highest quality ingredients, and you can definitely taste the difference. Thank you so much for the personal touch and I will continue to send all of my friends to Vapor Vapes!! Pros: Distinct coconut and pineapple as expected. Very pleasant to vape. Cons: May want a flavor boost addition b/c of the subtle flavor. Pros: Great taste, just like a virgin Pina Colada. Cons: Might be too sweet for some. It's a bit too sweet for me for an all day vape, but just barely. Pros: Love love this flavor. One of my favorites. Final Thoughts: If you like coconut and pineapple you will enjoy this flavor. Great! Pros: needs to steep at least a few weeks before it can taste good. it tastes creamy! Pros: Honestly in my top five favorite e juices. I used this flavor on my cruise and drank a lot pina coladas and they are all tasted very similar to this e juice. Final Thoughts: Description says it all. Pros: I'd didn't taste like a piña colada. Cons: Has more pineapple flavor than coconut. The mix isn't right. Pros: Very tasty, uplifting flavor that takes me straight to the beach. Pros: Am I at a beach side bar? No, I am vaping a pina coloda, delicious! Pros: very satisfying a must have for pina colada lovers. Pros: Very delicious and refreshing. Final Thoughts: I've tried other Piña Colada e-Juices, and will never go back to any other company. The other Piña Colada e-Juices were overbearingly sweet, and the flavors tasted very artificial. Thank you, Vapor Vapes, for my favorite go-to e-Juice! Pros: Smooth great taste,best juices!! Pros: Awesome flavor. Best Pina Colada I've had.